For the past couple of days Oman has been under the grip of a rumoured cyclone as lot of people from Oman have emailed Pakistan Weather Portal (PWP) to ask whether a cyclone is expected in Oman. In March 2014, UAE witnessed strong rumours about a week-long thunderstorm. Is a cyclone forming in the Arabian sea? On May 4, PWP did say that a numerical model (CFS) shows a tropical depression in the central Arabian sea but it was early to trust that track and reach conclusions. PWP did not focus on that forecast as it was early to go in depth. PWP told it’s readers that they should not trust that map as numerical models update themselves every 6 hours. Out of the 14 numerical models that were analysed by The Portal, only three models (NAVGEM, CMC and MOD) show that a tropical storm might move towards Yemen and adjoining Oman while the rest show nothing or a system fizzling out in open sea waters. PWP believes a circulation might form in the central Arabian sea on May 31 or June 1 that might eventually move in a western direction. This circulation would have a negative impact on the Indian Monsoon as it would drift all the moisture away from the western coast of India hence a delay over the monsoon in the Indian state of Kerala may occur. PWP would go in detail for this weather system if necessary but The Portal would wait for a low pressure to form first. In May 2002, a relatively weak cyclone made landfall over lower Oman and killed 9 people. It brought 251 mm rain to Oairoon. In June 2007, a category-5 super cyclone ‘Gonu’ made landfall over northern Oman. It had the strongest winds for a cyclone in the north Indian ocean that was 165 miles per hour. The super storm killed 50 people in the country and brought 600 mm rain to the desert state. In June 2008, a depression in the Arabian sea brought local heavy rain to parts of Oman. In June 2010, a category-4 cyclone ‘Phet’ killed 24 people in Oman. It was the second strongest cyclone in the Arabian sea after Gonu. 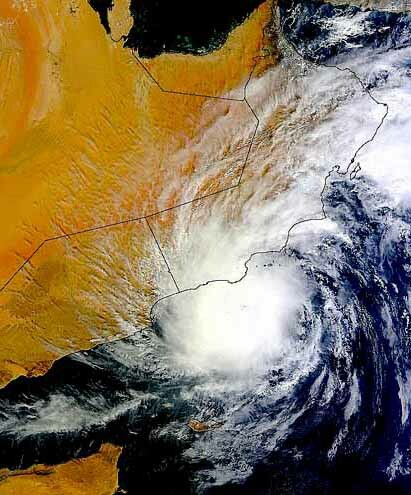 In November 2011, cyclone ‘Keila’ killed 14 people in Oman. Torrential downpour was reported from the state. ← Monsoon 2014: Pakistan and India at the mercy of strongest El-Nino in decades! I am voting for western KSA and Yemen rather than the Sultante of Oman for some serious rainfall, because that is the direction that the water vapor is currently traveling, and there does not seem to be any atmospheric dust out in the Arabian sea to steer the cyclone toward Oman. Check the link I have put below my details for this posting, for a water vapor movie. http://www.ssec.wisc.edu/data/comp/wvmoll.html and new information about the torrential rainfall at http://www.ecoseeds.com/cool2.html with the storms around Arabia over the last few years. A very interesting batch of moisture currently south of Arabia. It has formed and named ‘Nanauk’. It is move likely to move towards Oman, some stray weak thunderclouds may form over coastal areas of Pakistan.